The Samsung Galaxy S5 is a dust and water resistant 16 megapixel smartphone that runs on the Android 4.4.2 (Kitkat) operating system. 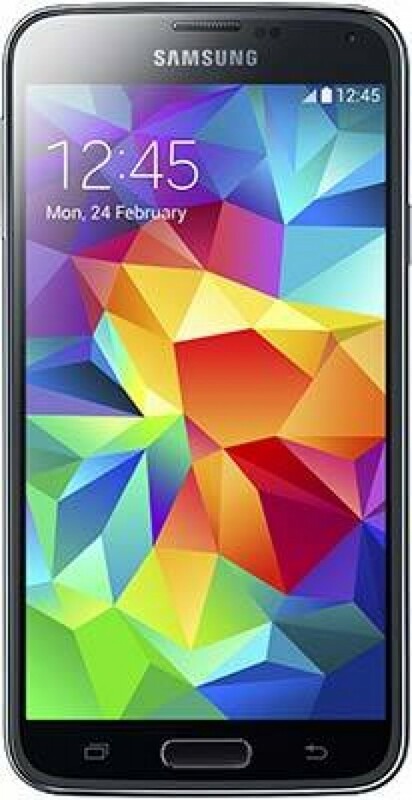 The Galaxy S5 has a 31mm fixed lens with an aperture of f/2.2 and picture stabilisation, fast autofocus speed of up to 0.3 seconds, Selective Focus feature, a 5.1-inch FHD Super AMOLED touchscreen with a resolution of 432ppi, a built-in LED flash, Wi-Fi, GPS and 3G/4G connectivity, real-time HDR, and 4K UHD video recording at 30fps. The Samsung Galaxy S5 costs around £499 / $599 without a contract and is available in black, white, bronze or blue. The Samsung Galaxy S5 measures 142.0 x 72.5 x 8.1mm, which means that it can be easily stored inside a trouser pocket, and weighs 145g without battery and card, slightly bigger and heavier than the previous S5 model. It's undoubtedly a large but very slim device that will definitely get you noticed. Build quality is fine, but not class-leading, and having to remove the plastic cover off the back to insert a microSD card is more than a little disconcerting!The The Samsung Galaxy S5 is now dust and water resistant, though, which should provide some reassurance when using it in more hostile environments (like a light shower). The Galaxy S5 has a fixed lens with a focal length the 35mm equivalent of 31mm, supported by a fairly effective picture stabilisation system. Note that this isn't an optical based system, but an electronic one, where the S5 quickly takes and combines a number of different shots to produce an optimum one. Curiously this option isn't available if you decide to manually set the ISO speed - we've no idea why. There's now 16-megapixel effective resolution from the standard sized 1/2.33-inch BSI CMOS sensor, up from the S4's 13 megapixels. On the back is a very impressive 5.1-inch, 1920 x 1080 pixel FHD Super AMOLED touchscreen display, and the S5 zoom runs the very latest Android 4.4.2 Kitkat operating system. The plastic back cover aside, with what feels like a higher proportion of metal in the build than plastic, the Galaxy S5's sleek and stylish exterior certainly looks the part. Other than the lens, the only other features on the sparse front of the Galaxy S5 are two slots for the microphones and the LED flash unit, positioned directly below the lens. Located on the top-right-hand corner is a thin power button. Hold this down for the first time and the Galaxy S5 stutters into life, taking quite a while to display a series of graphical screens, with the rear screen switches to camera mode a couple of seconds later. The startup time from Standby is thankfully much quicker at just under 2 seconds, roughly what we'd expect from a point-and-shoot camera, although no speed demon. Thankfully there's now a physical shutter-release button on the Galaxy S5, as well as a soft key on the touchscreen, a very welcome improvement on the S4. To focus, simply tap anywhere on the screen and the AF point appears in green along with the customary confirmation 'bleep', then either tap the soft shutter button or press the actual button to take the shot. A full-sized 16 megapixel image is committed to either the built-in memory (16/32Mb) or an optional micro-SD card (up to 128Gb) in one to two seconds, which is impressive. You can even take a picture using the power of your own voice, with "capture", "shoot", "smile" and "cheese" commands all available. Voice control can also be used to zoom the lens, fire the flash, set the timer options, and change the shooting mode, amongst other settings. The S5 is faster to focus than its predecessor, now taking only 0.3 seconds to lock onto the subject in good lighting situations. The Samsung Galaxy S5 has an array of beginner and more advanced shooting modes. The subject recognizing Auto setting is point and shoot all the way, the camera getting it mostly right, although - typically - busier scenes can confuse the auto-focus and the shutter will still fire even if the image is noticeably soft, so you can occasionally come away with blurred results. There's also a range of clever scene modes, including the useful HDR and Panorama modes, and creative filters which are accessed by pressing the arrow icon at the bottom of the touchscreen, useful for previewing and adding a not-too-cliched effect. The HDR mode can also be toggled on and off in real-time by a handy on-screen icon, allowing you to preview the effect before shooting, although you still can't change the strength. In terms of photographic features, the default camera app also allows you to choose the ISO speed (100-800), metering (centre-weighted, matrix and spot), white balance, exposure compensation, turn burst shot, face detection and anti-shake on or off, set the photo and video sizes, configure the self-timer, and set the flash to on, off or auto. The Samsung Galaxy S5 is one of the first smartphones on the market to record 4K UHD video, in addition to standard FullHD (turned on by default), although the stabilisation system for video is electronic rather than optical. Pressing the Home button fires up the Galaxy S5's default screen, which displays the time and date, allows you to perform a Google Search, includes icons for the Paper Artist, Instagram, Photo Wizard, Video Editor, Camera, and Gallery apps, plus Dropbox, Play Store and a further Apps icon which accesses all the default apps and the Widgets screen. Having the ability to connect to a wi-fi network or cellular data if using a SIM card, then edit your images and video with either the Samsung apps, Instagram or any one of hundreds of other Android apps, and then upload them to your favourite online network quickly becomes compulsive and makes the traditional process of downloading to a computer seem laborious and old-fashioned. With the 5.1-inch screen swallowing up the entire backplate of the Samsung Galaxy S5, apart from the Home and Shutter buttons, there are very few other physical controls apart from a headphone port and a volume control button. Note that the battery can be removed, but charging is still done in-camera.